The International Criminal Court (ICC) prosecutor has asked judges for arrest warrants to be issued for three rebel commanders in Sudan's Darfur region. Luis Moreno-Ocampo, who alleges they killed 12 African Union peacekeepers, said the men would not be named. "It's an opportunity for them to show they respect justice to come to The Hague voluntarily," he told the BBC. Some fear that if the president's indictment proceeds it could derail peace efforts. Last week, Sudanese President Omar al-Bashir announced an immediate ceasefire in the Darfur and promised to begin disarming militias and restrict the use of weapons among armed groups. But on Thursday, UN chief Ban Ki-moon said he had received "troubling reports" of aerial bombings near Kutum in North Darfur, and fighting in the area of Tine, in West Darfur. The Sudanese government has denied rebel claims it bombed their territory. The UN estimates that up to 2.7 million people have been forced from their homes in Darfur and some 300,000 have died during five-and-a-half years of conflict. Mr Moreno-Ocampo said that in September 2007 more than 1,000 rebels attacked the AU peacekeepers' base in the town of Haskanita, in southern Darfur. He accused them of committing war crimes including murder, pillaging and deliberately attacking the peacekeepers. "We have solid evidence showing exactly who commanded, how they commanded and how the attack was perpetrated," Mr Moreno-Ocampo told the BBC's Focus on Africa programme. "No-one who's attacked peacekeepers will be immune," he said. He said the names were being withheld "to ensure the appearance of these individuals in front of the court". The ICC has already issued two arrest warrants - in 2007 - for Sudanese Humanitarian Affairs Minister Ahmed Haroun and pro-government militia leader Ali Mohamed Ali Abdel-Rahman - known as Ali Kushayb - for alleged war crimes in Darfur. Sudan has refused to co-operate with the ICC case and insists on conducting its own investigations. Ali Kushayb was taken into custody by Sudanese authorities this year. Mr Moreno-Ocampo said that even though Mr Haroun had not yet been arrested, it was a question of time. "The destiny of Haroun is to face justice - in two months or two years." The ICC prosecutor has said there are grounds to believe Sudan's president bears criminal responsibility on 10 counts of genocide, crimes against humanity and war crimes. 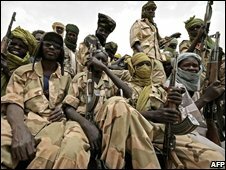 Sudan's government has always denied charges that it armed the Janjaweed militias accused of widespread atrocities against civilians in Darfur. It is lobbying hard for the UN Security Council to delay an ICC investigation into whether President Bashir should be charged.